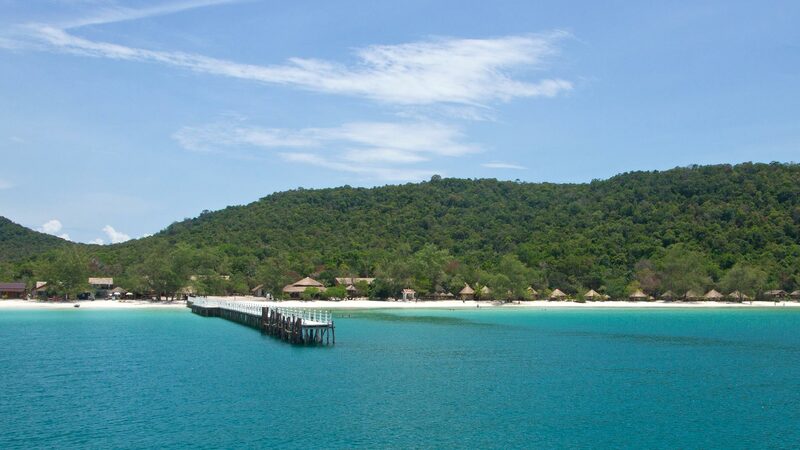 Koh Rong Samloem is located off the coast of Sihanoukville in Cambodia and is still relatively unknown. 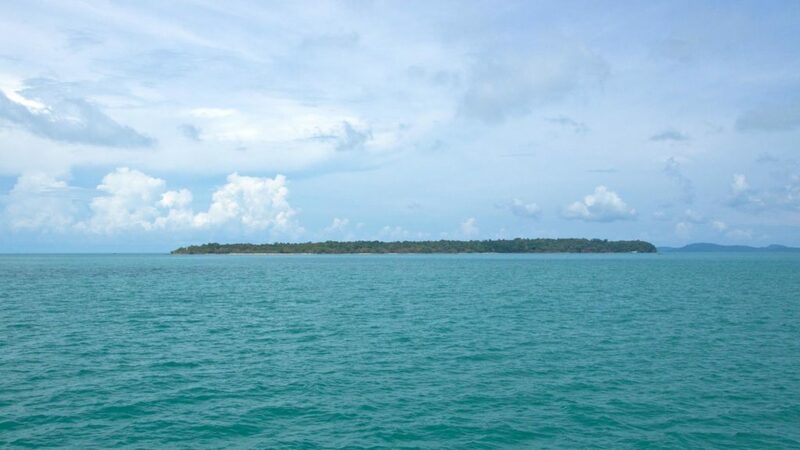 The slightly larger neighboring island Koh Rong is at least known with some travelers in Asia. During my stay in Sihanoukville I made a day trip to Koh Rong Samloem and was absolutely thrilled by the island. Koh Rong Samloem is a small paradise that welcomes you on arrival with a dreamlike white sand beach and crystal clear water. There are several ways to get from Sihanoukville to Koh Rong Samloem (sometimes also spelled Koh Rong Sanloem). You should be sure where the boat is going before booking your ticket. Sometimes it’s a little bit confusing, because the neighboring island’s name is also Koh Rong, just without the “Samloem”. The boats to the island all start at the Serendipity Beach Pier in Sihanoukville. If you already have a booking for an accommodation on Koh Rong Samloem, they often organize the transfer to the island. If not, then you can buy a ticket for the boat in one of the many hotels, travel agencies or directly at the pier in Sihanoukville. 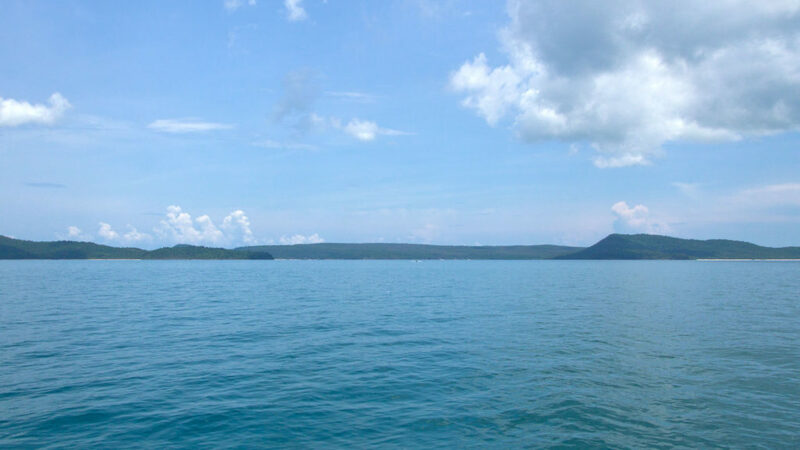 There are two daily boat trips from Sihanoukville to Koh Rong Samloem at 8.30 A.M. and 3.00 P.M. The ride takes approximately 45 minutes with a price between $10 – $15 per trip. The prices vary slightly between high and low season (June – September). If you only want to do a day trip, you could choose the operator Sun Tours, who stops at Koh Rong Samloem and another island, Koh Tas. 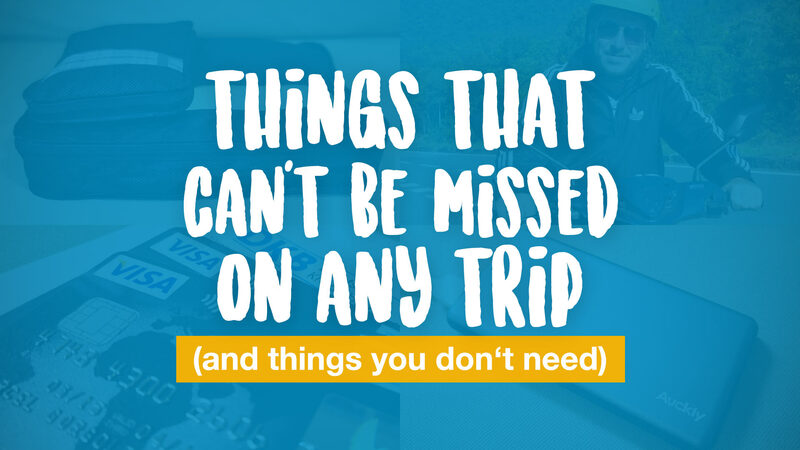 The trip starts around 9.30 A.M. and the price is $25. You will be back at the pier in Sihanoukville around 4.30 – 5.00 P.M. A small lunch is included in the price. Note: You can find more information about the tour operators and how to get there here. We did the day trip with Sun Tours and boarded the boat at 9.30 A.M. The trip started around 10.00 A.M. and then we drove about 1 ½ hours past many of the 32 islands that lie off the coast of Sihanoukville. 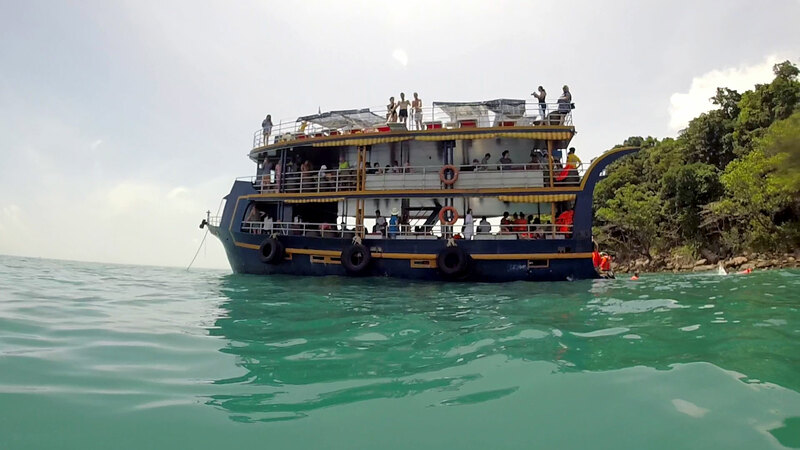 The boat anchored off the coast of Koh Tas for another hour and all the guests could go swimming, snorkeling or jumping from the boat’s upper floors into the ocean. The water in front of Koh Tas was dreamlike. Very turquoise and clear, however, the underwater world was not really filled with life. There were lots of sea urchins, but we could only spot a few fish. Also, the water had heated up pretty much and was not cooling down as we hoped. After snorkeling and swimming in front of Koh Tas we had a lunch buffet on the boat during the rest of the trip to Koh Rong Samloem. Various noodle and rice dishes, some chicken, vegetables and bread. Although not the very best food, it is enough to be satisfied. To Koh Rong Samloem perhaps a 45 minute drive was before us and the island was already on the horizon. While swimming in front of Koh Tas was quite nice, I was excited to finally visit the paradise beaches I’ve seen on pictures. Even the arrival at the Saracen Bay, where the boat docked at the pier, was fantastic. White gorgeous sand as well as turquoise and crystal clear water. That’s what I was looking for. 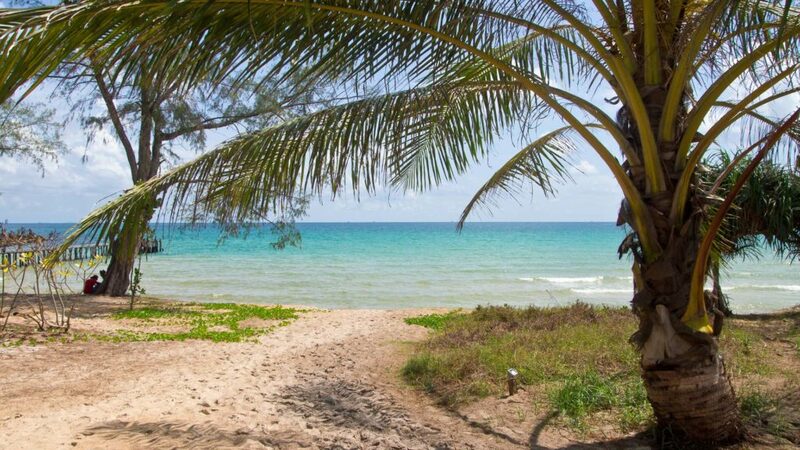 There are 3 beaches or bays on Koh Rong Samloem. The first bay with an amazing beach is the Saracen Bay. This is where almost all boats arrive and most of the accommodations are right here on the beach. It is also the place where the most is going on. Nevertheless, it is still very quiet and idyllic since there aren’t many visitors at all. In addition to the accommodations, there are a few small bars and restaurants, that are often attached to the bungalows. 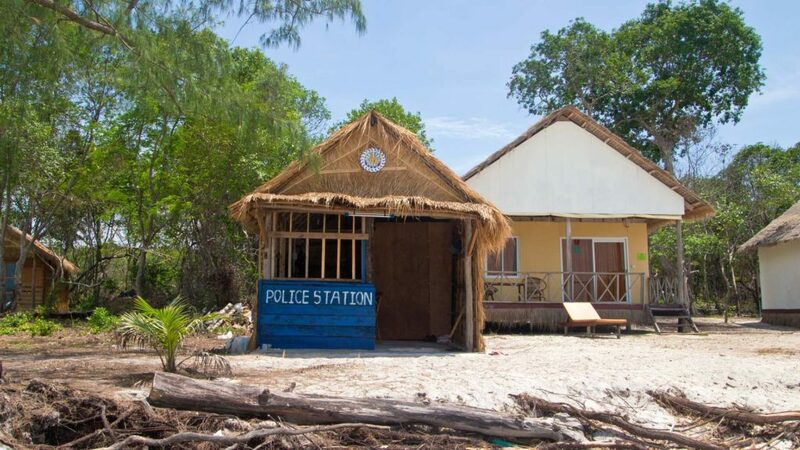 Furthermore, there is a small police station and apart from that just a peaceful tropical ocean environment. Perfect to enjoy a few quiet days on a true paradise island. From the Saracen Bay you can walk across the island to the second beach, the Lazy Beach. It is a short way through the jungle of the island. There you can also meet monkeys or snakes. 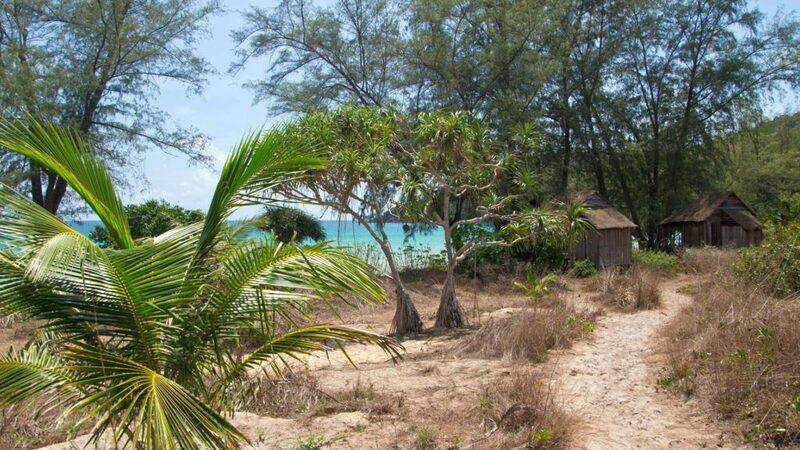 As there are no roads on Koh Rong Samloem, there is nothing left to do but walking. Depending on how fast you walk, it takes you 20 to 30 minutes across the island. The Lazy Beach is still a lot calmer than the Saracen Bay and there is not much going on. 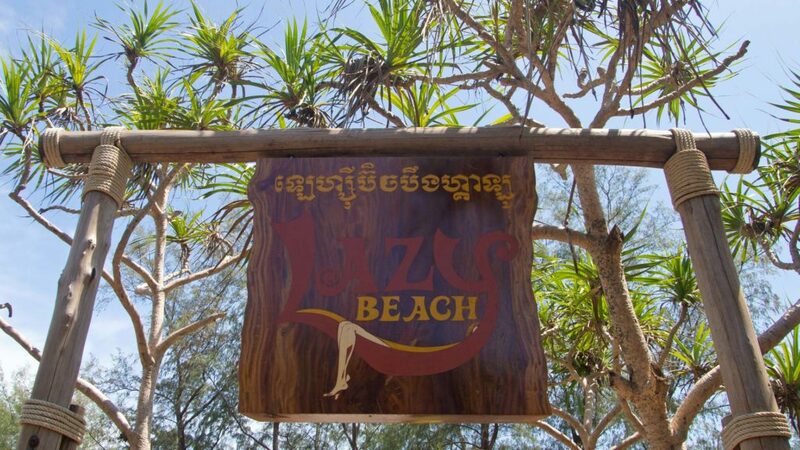 If you want to stay overnight, you have the opportunity to stay at the Lazy Beach Bungalows. Awesome small bungalows right on the beach. Tranquility and seclusion guaranteed. Otherwise, there is not much to do at the Lazy Beach, which is not the worst thing if you want to relax and rest a few days. 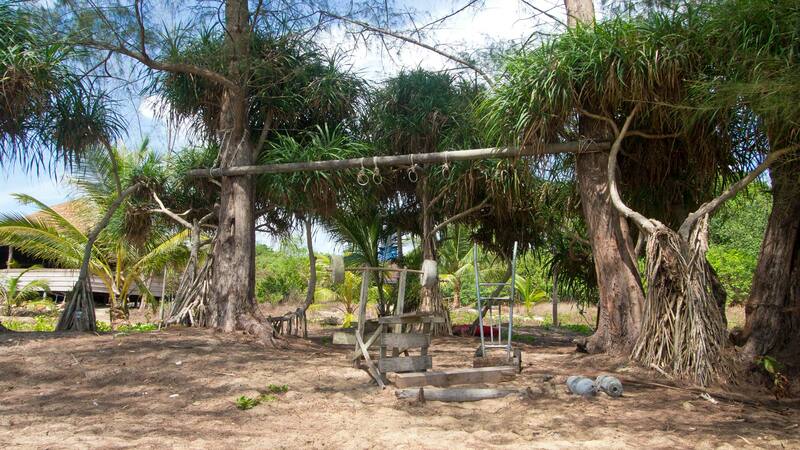 You can go for a swim, exercise in the “open-air gym” or grab some food in the restaurant on site. The third bay of the island is the M’Pay Bay. Another small bay with a village and a fantastic beach, which is also very quiet and relaxed. 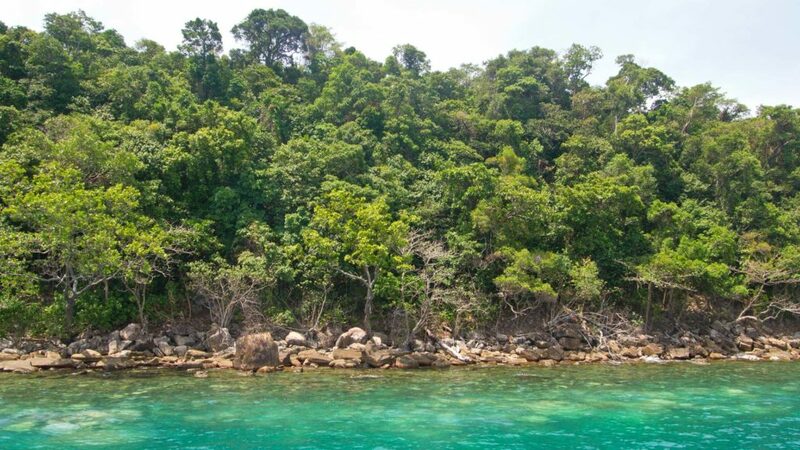 Since I was only on a day trip on Koh Rong Samloem, I unfortunately could not visit this bay. But I will catch up on this next time and for the sake of completeness I wanted to mention it anyway. 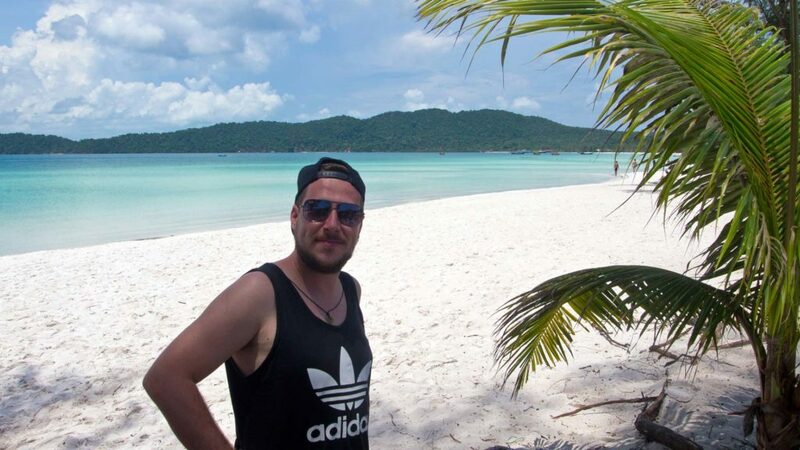 I expected Koh Rong Samloem to be like paradise and it definitely met my expectations. 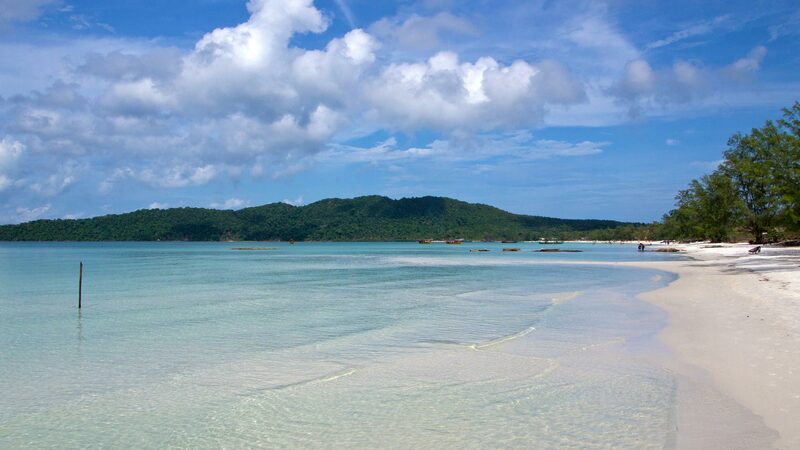 It is a dreamlike, quiet island and I will come back one day for sure. Of course that won’t be for a day trip and I will probably stay a couple of days on the island. To get to know the island or if your time is limited, I can totally recommend a day trip from Sihanoukville. It is absolutely worth it! 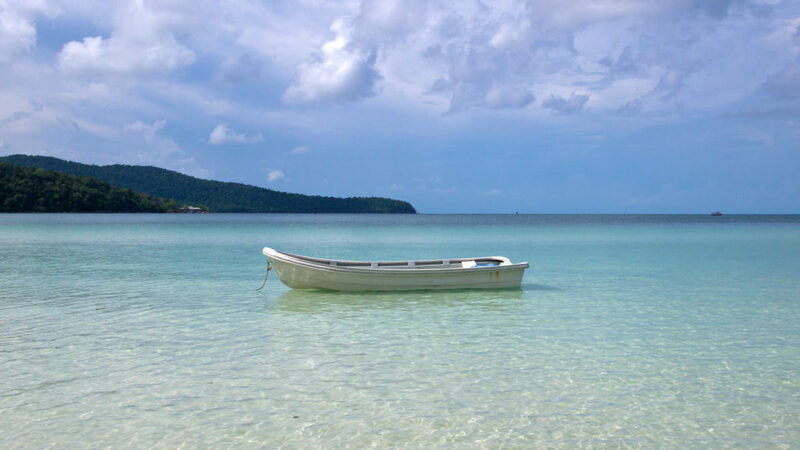 Have you ever been to Koh Rong Samloem? Did you like it? 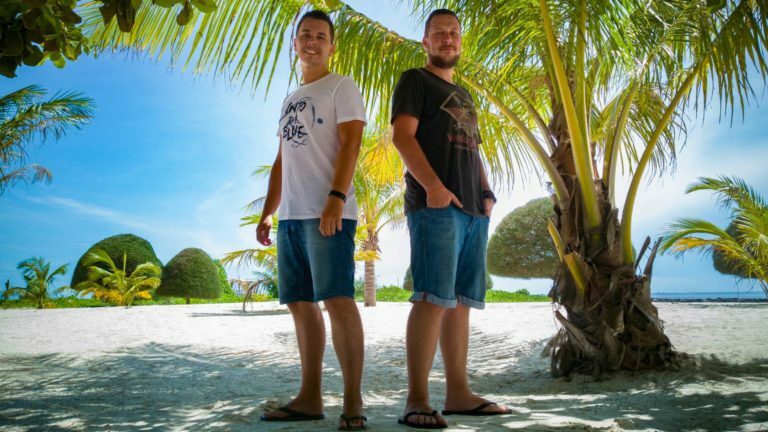 Which islands nearby can you recommend? Leave us some feedback below! Thanks for the invitation to the Tourism Authorities of Cambodia and Thailand, who made this day trip possible. Opinions and recommendations are, as always, our own and we were not influenced by the invitation. Hello and thank you for this description of your trip. When did you visit Koh Rong Sanloem? What season and which year? I’ve visited the island two times now. First time was in May 2015 where I wrote the article. The second time was just in November 2016, which was a bit wavy and therefore not as paradiselike as before. It was just the beginning of high season in November so I guess from December on it will be better and most likely the same as in the article. Thanks for your writing and the pice. Great job. 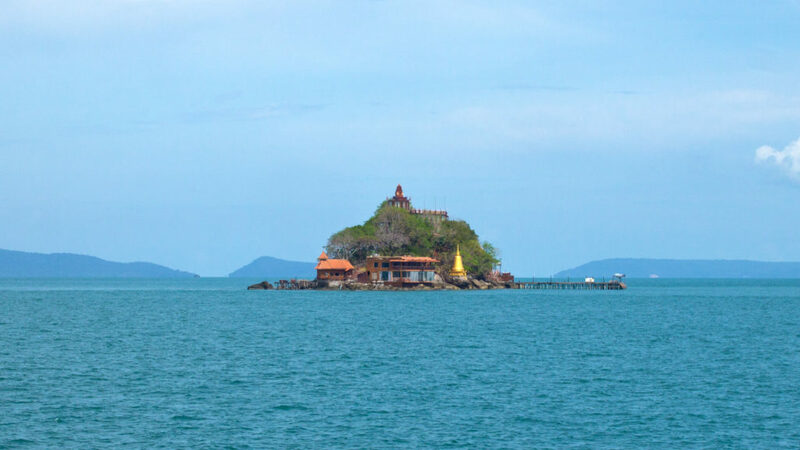 I was looking for an Island in Cambodia. This will be my first stop.